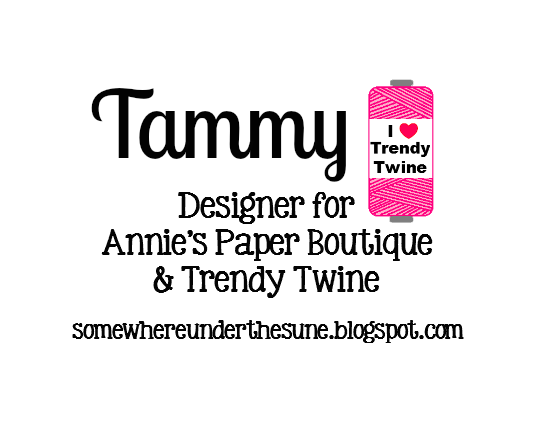 I am over on the Trendy Twine Blog today. It's a little bare under the tree, and it's time to think about thank you notes to show appreciation for those thoughtful gifts. I have one to share today featuring Candy Cane Trendy Twine. I started with a red card base and then pieced together two patterned papers from my stash. I took a length of Candy Candy Trendy Twine where the papers met. Next, I die-cut a tree from patterned paper and trimmed it with some more Candy Candy Trendy Twine adding to the left side of the card front by adhering with foam adhesive. I stamped my sentiment adding a Candy Candy Trendy Twine triple bow to the top. All other products used were a combination of Sizzix and Reverse Confetti. Very pretty card! !Wishing you and your a Bless New Year!!! A beautiful thank you card, Tammy! Love the tree, papers, and twine! Happy New Year to you and family! Terrific design Tammy, love your mix of patterns!! Hope you and your family had a wonderful Christmas!!! Such a pretty thank you card! Love the gorgeous papers you used to created it too! So, so cute! Love the polka dotty tree, and LOVE how you used the twine! This is such a fun and festive thank you card for all of those wonderful gifts received during the Christmas season. Love it! So cute Tammy! I love all the fun paper and the great tree!